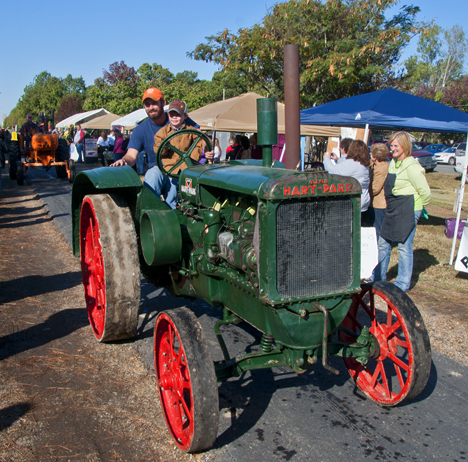 The 35th Annual Grand Prairie Rice Festival at Hazen, Arkansas, included a parade of finely restored farm tractors. The family-friendly event was well attended by an enthusiastic crowd. For 35 years, folks at Hazen, Arkansas have been celebrating a crop that grows well on the Grand Prairie of Arkansas, where they just happen to reside: rice. The Grand Prairie boasts fertile soils, is as flat as a pool table for the most part, and has an underlying clay strata which tends to hold surface moisture in place. If ever there were ideal conditions to cultivate rice, these are it. And cultivate it they do. Since the late 1800s. The good folks at Hazen consider these conditions to be a good foundation for celebration — and celebrate they do at the Grand Prairie Rice Festival. And we are there, so to speak. Before we go too much further, let us point you to see where this story started at Corndancer dot-com, where you will see a well-restored, giant 92-year-old antique rice well pump engine operating at the festival. You will also meet the gentleman who did the restoration and shows the machine. Though this neck of the woods was rife with these units at one time, this one is the only one left that we can find. Click here to see seven additional pictures of this unique piece of mechanical history. 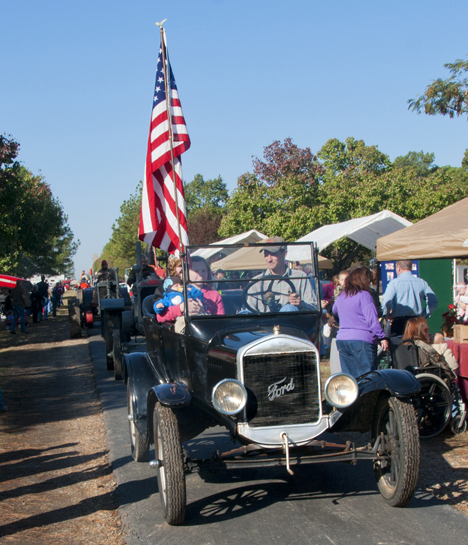 Mason Sickel of Tollville leads the parade in his restored T-model Ford. The festival is a is an exercise in and a fine example of living history. Eighteen well-restored tractors participated in the parade. Click here to see all 18 tractors. I was originally invited to attend the festival in 2009 by Mason Sickel of Tollville AR. I had photographed his pink 1963 R185 International Harvester tractor and had the good fortune to meet him after the shoot. He showed me some of his antique restored tractors and invited me to the festival. I’m glad I finally made it. (That weekend is when I accompany several of my hoodlum friends on a fishing trip. They fish. I shoot). Seth Skarda of Hazen set up and operated his restored forties-era rice threshing machine and demonstrated its operation. His good friend Mason Sickel is operating the pitchfork to feed the machine. 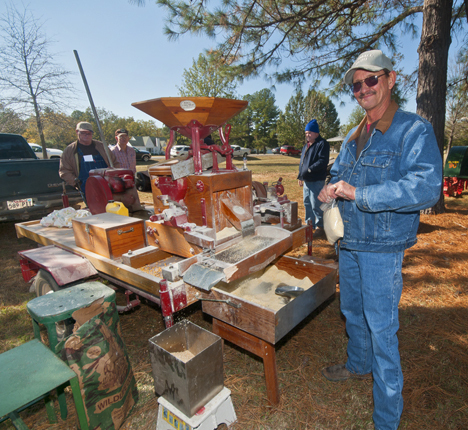 Seth Skarda’s fully operational forties-era rice threshing machine was a hit. Dozens of onlookers watched the ancient machine shake, rattle and roll as it separated rice from its stalks. The machine has no power source of its own and was driven from a large “flat-belt” running from the power-take off pulley of a 1949 Oliver Model 90 tractor. 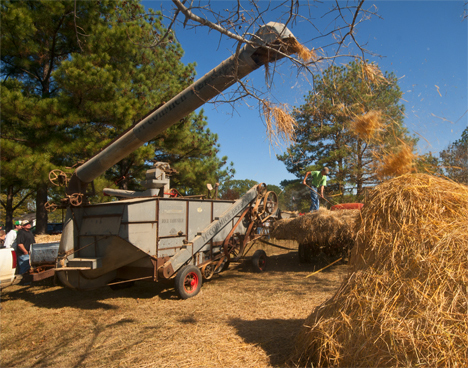 Click to see 11 pictures from a complete walk-around of the threshing machine operation, including the 1940 International truck full of rice and the Oliver tractor. 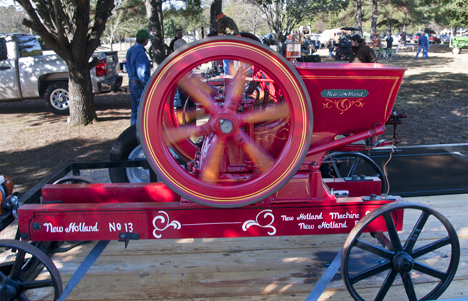 This completely restored New Holland power unit hit the streets in about 1912 according to Bob Sutton, the owner. These units were used wherever one had the need for rotary power. Water pumps, grist mills, and generators were among those uses. Not all of the machines on display were large. I found a small 1912 New Holland gasoline power unit with its fly wheel spinning and its cylinder hitting only often enough to keep the machine going. I struck up a conversation with the owner, Bruce Sutton of Mount Ida. About five minutes into the conversation I discovered he originally hailed from McGehee, Arkansas. After further interrogation, he freely admitted that he grew up with my friend and Ouachita Baptist College college classmate Jimmy Dale Peacock, formerly of McGehee. Further, he knew a number of other classmates from that area. Small world. Alan Sickel smiles as he prepares to hand me one of four bags of freshly ground corn meal. He refused payment from me and any one else who wanted some of his meal. The antique grist mill above has been in the Sickel family since the 1800s. It is powered by an antique International Harvester gasoline power unit. Click here to see additional pictures of the grist mill. Great Horned Owl from Raptor Rehab of Central Arkansas. The non-profit organization's home is at El Paso, Arkansas. Not all of the attractions were mechanical. Notably some were alive, well, and feathered. Rodney Paul and volunteer Kenley Money of Raptor Rehab of Central Arkansas brought some of their charges including the Great Horned Owl you see above, a barn owl, a barred owl, and a screech owl. They carried some of the birds with them as they strolled through the festival and explained some of the noble work the organization does. They also made a detailed presentation to an attentive and appreciative audience. 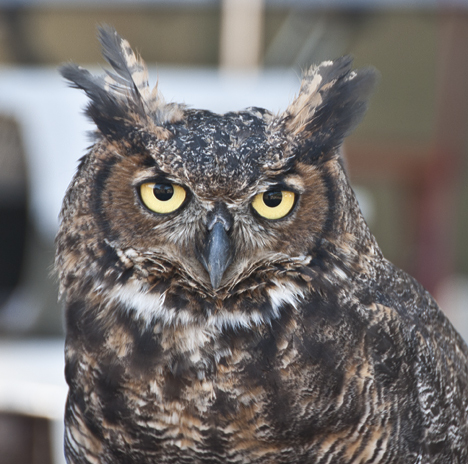 Click here to see all nine of our owl pictures. The good folks at Hazen know how to put on a great event. I give it five big ol’ stars. For history buffs, it’s like a trip to a history candy store. For gearheads, it is near Nirvana. For kids it will be an eye-opener. Do yourself a favor and put this one on your calendar. Click on the picture to see What's Left at Lester. It's an eye full. Unfortunately this week, the schedule weevils infected my routine and subsequently, my heart-felt desires to photograph a new subject and write a new story were thwarted. As a well experienced, card-carrying human being, I have learned that these things happen and that one should take them in stride while licking ones chops in anticipation of the next adventure. That being said, I am sending you this week to tiny Lester, Arkansas, a place I first visited in January of 2009. What Lester lacks in size, it more than makes up for in pure curiosity in its remaining commercial structure, the old “store.” Take a look at “What’s left at Lester.” While you are clicking be sure and see (as in “don’t miss”) the original Lester pictures and story on the January 25, 2009 Corndancer Photo of the Week page. This trolley at the Fort Smith Trolley Museum is completely cosmetically restored. The restorers are now working on some final mechanical and electrical details to make the car fully operational. 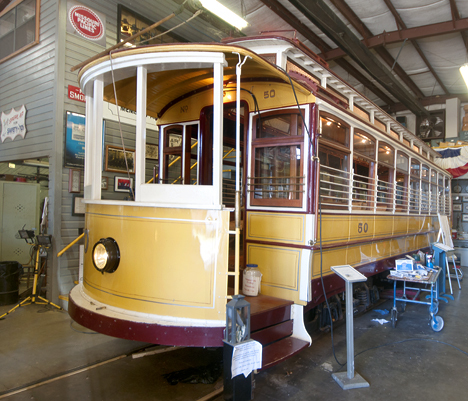 While visiting Fort Smith, Arkansas, the place of my birth and upbringing until my 15th year, during a high-school reunion, I stumbled across the Fort Smith Trolley Museum and discovered a old trolley nearly restored to operational condition. As you can see, the restoration job is pristine as would be expected when the labor is provided by dedicated volunteers. The museum people were very congenial and informative. You can follow the trolley museum on Facebook. Actually, the trolley was my second shoot of the morning. The first was at Oak Cemetery in Fort Smith, where I hooked up with some high school classmates to shoot a unique and remarkable monument. At the time, the appearance of the grave was reason enough to make a special trip to shoot it. Turns out, there was a story behind the artistry in the cemetery. Go to the Photo of the Week page at Corndancer dot-com to to see the monument and get in on an interesting story. We’ll wait here for you. Meanwhile, back at the trolley museum, the trolley crew told me about the restored trolley. Museum officials found the trolley rotting in a field west of Hot Springs, Arkansas. The last place of the trolley’s active service was in Hot Springs. They showed me a picture of the trolley as they found it. The nicest thing you can say about the trolley as they found it was “pitiful.” What the Fort Smith volunteers have done with the trolley is miraculous. They are performing similar miracles on another trolley in the same shop, this one, an open trolley from Vera Cruz, Mexico. Frisco steam locomotive 4003 on static display at the Fort Smith trolley museum. The folks at the trolley museum show an interest in more than trolleys. 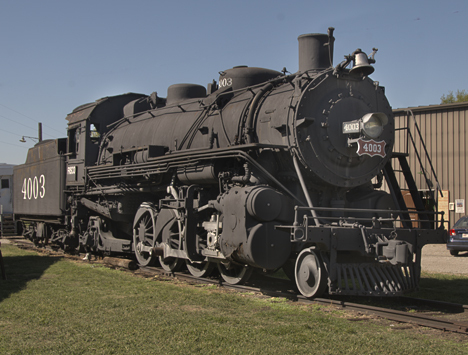 They have a nice collection of rail equipment including cabooses, a dining car, and a whopper of a steam locomotive, the 4003 from the former Frisco Railroad. As I recall, back in the day, Fort Smith was served by the Frisco and the Kansas City Southern railroads and each railroad had their own depots. The environment for this old abandoned native stone structure is I-40, just south of Clarksville, Arkansas. Its job is to watch traffic go by. One of my deals as a photographer is to show the subject in its environment which generally means that closeups are not a dominant force in my portfolio. I like to show some surroundings. Having driven by this old building on I-40 south of Clarksville AR about a jillion times without noticing it, I was delighted to finally notice it on this trip — while being ashamed of myself for not noticing it earlier. Then it occurred to me that I should probably include interstate traffic if I was to hold to my thing with a bit of environment in the shot. It took about a 100 shots or so to catch a truck in just the right place, but was worth the wait. 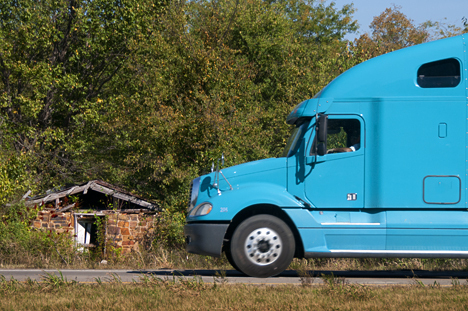 In the immortal words of Hank Snow, the truck was “movin’ on.” I set the shutter speed high. 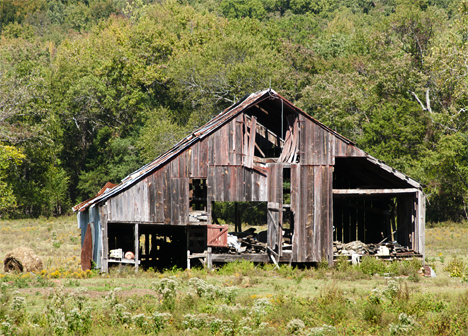 This old barn on US 64 has seen better days and is now a detritus dump. On the trip to Fort Smith, I was running ahead of schedule, so I dropped off the interstate and traveled north on US Highway 64, the artery which was replaced as the main east-west thoroughfare by I-40. I figured I would spy an old barn or two and was not disappointed. The remnants of a lightning rod system are dangling from the peak of the roof. From all appearances the last use of the barn was typical of many in their last useful days — a repository for the the stuff you don’t want to throw away (but probably should), but can’t find anywhere else to dump it. And life goes on. Click on the bears and go to "You belong in a zoo." This week instead of a new post, we are redirecting to an archive post, “You belong in a zoo I.” The pictures and story are from the Memphis Zoo during the time they had panda exhibit. You will find a link to the panda story when you go to that post, or you may click here and see the pandas. 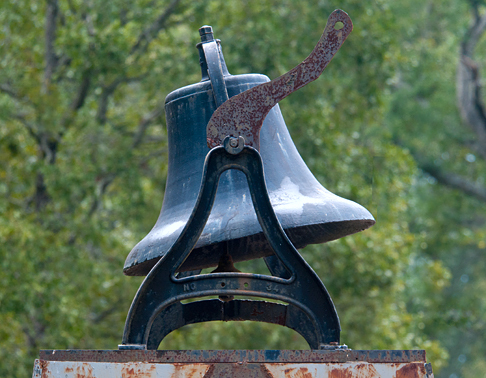 There's no rope on the lever of this bell at Macedonia Missionary Baptist Church in Lincoln County Arkansas. And it appears that it is frozen in the upswing for a "ring." I wonder why? On the other hand, a storm is brewing, the sun is setting and the king of the skies, a "turkey buzzard," is making a beeline for his home base, all of which are not to bad to observe. If “Googling” is any indication, “Macedonia” has to be one of the most popular names for a Missionary Baptist Church in the lower 48. 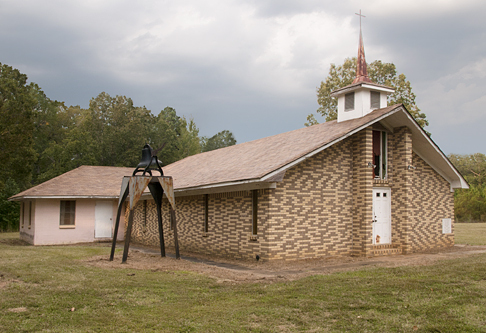 As I was Googling to capture some information on Macedonia Missionary Baptist Church in Lincoln County, Arkansas — and its bell — I was presented with hundreds of Macedonia Churches, none of which were the one I was seeking. Maybe thousands if I followed the Google pages to infinity. Thus rebuffed, I decided to wing it. According to the plaque on the church, it was organized by Elders B. Dabney, M. Nelson, and Deacon C. P. Powell in 1886 and rebuilt in 1980. Past that, I’m in the dark. Before I got to the church and it’s fine but silent bell, I ran across an abandoned and sadly deteriorating 1955 four-door Ford Fairlane. It is “Elvis Pink,” a popular color option of the day — and is on it’s last legs. The car has been sitting there since 1966 and looks it. See this rotting relic on the Photo of the Week Page at Corndancer dot com, where this adventure started. We will wait here for your return. The bell ain’t going anywhere. As you can see, the lever to ring the bell was cut from what appears to be 3/8 steel plate and was not original equipment which would probably have been bronze. The lever is peppered with a predictable patina of ferrous oxide, AKA rust. 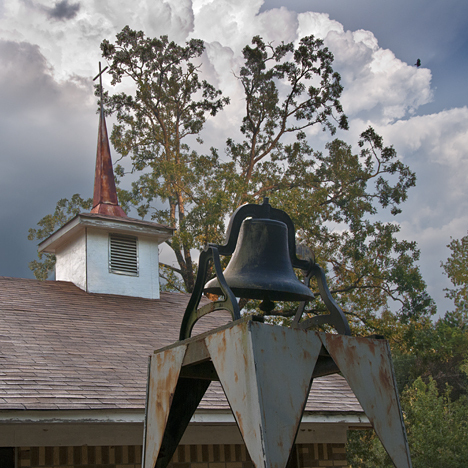 See a great sunset, another picture of the bell and more in our Weekly Grist Gallery. In the absence of sounds from the bell, we can only but imagine the joy and sorrow accompanied by it’s clarion tone in better days — announcing to church goers that it is time to stop visiting and start worshiping, ringing in a happy life for newly weds, the last toll for lives fulfilled — and perhaps neighbors rang it to notify the community of a fire, other emergency or a community gathering. It was probably the only mass communication device for miles. Macedonia Missionary Baptist Church, Lincoln County, Arkansas, organized in 1886 has weathered many a storm and in this picture is right before weathering another. 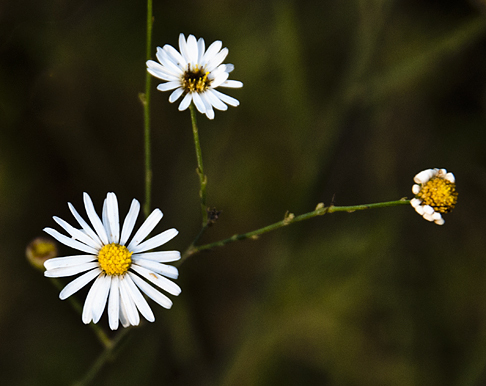 These flowers are folding their tents as summer winds down and fall rolls in. Already, we've started to feel a tad of a chill in the air. In a month or so, we'll be chattering. Changing seasons are a good time to pause for introspection. To look inward and see what needs to be fixed. Besides the rope on the bell. A late summer thunderstorm right before sunset created some favorable circumstances. See the sunset here. Also an old truck, three pictures of an forlorn old 55 Ford, the bell and more in our Weekly Grist Gallery. Thirteen pictures in all.